For Mother's Day, Pj ordered a copy of the new Wearing History trouser and overall pattern, which will arrive this afternoon or tomorrow. I desperately need to sew some pants for this fall and winter. I really wanted some more swing trousers and I needed the durability of jeans too so this pattern has everything a girl needs, all wrapped up in one! I wore my Heyday trousers constantly this winter and am really surprised at how well they are still holding up after all of the washing and wearing. They still look brand new! However, a girl really needs more than one pair of pants and since I'm such a funny shape, I decided to sew my own stock pile of jeans and trousers this summer so I'd have plenty of options when the weather gets colder. 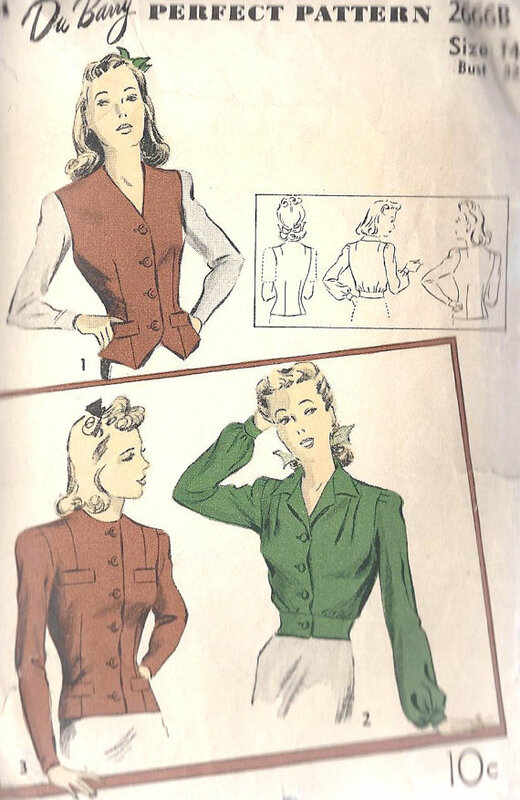 To go along with my trousers and jeans, I want to sew a fabulous 1940's jacket. I already have a couple of originals that I am madly in love with but most of them are lighter fabrics. After seeing Tasha's stunning Sew for Victory jacket, I decided to finally take on the project and sew my own jacket too! 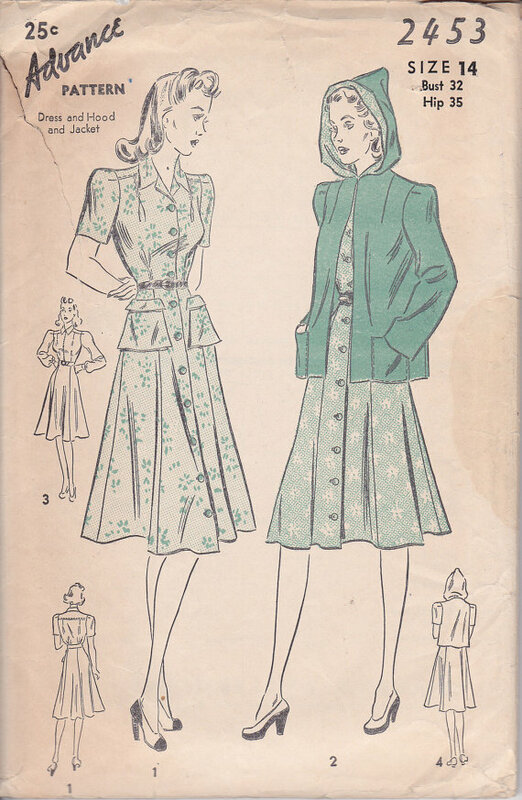 I ordered this pattern from lisaanne1960 this morning. Sewing wintery things in the summer is a great idea because fabric stores have all of those beautiful (and expensive) woolly fabrics on sale when it's 90 something degrees out. Do you like to sew your own hard-to-find wardrobe staples? What projects are you working on this summer? Looks like we've had similar sewing plans! I've made a couple of pairs from Simplicity 3688, including a pair of sweetheart overalls, and still have wool to make another pair for next winter (or this summer the way our British weather is going!). 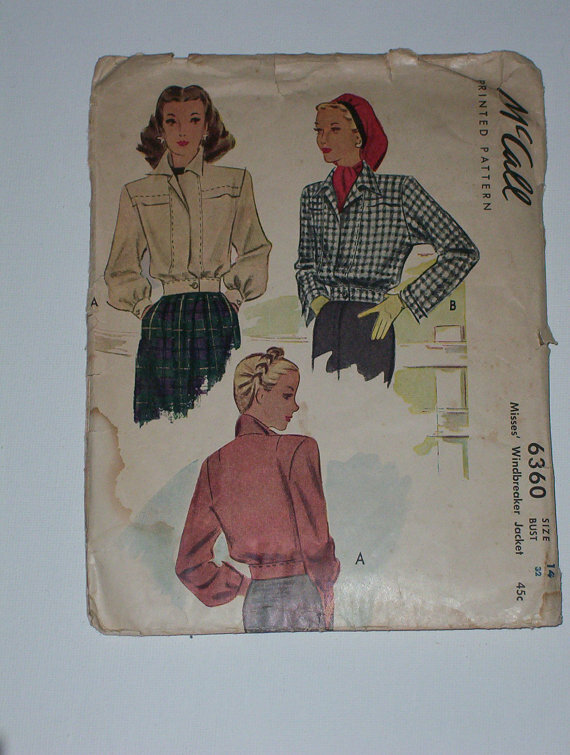 My next major project is a short jacket from Vogue 7146 from 1950 in red/black wool plaid. It will certainly be a slow-going project though. The pattern needs grading up 6" so I'll have to make a muslin, and I want to use proper tailoring techniques for a good finish that will stand up to wear. I look forward to seeing yours! What fabric are you planning to use? Yes, I will have to grade this one up a lot too. There was nothing larger than a 32 inch bust out there :( I'm hoping to make one in a plaid and one in a solid, both wool I think. Nothing cuts the wind like wool! If they turn out nice, I'd love to make one in a linen for spring time too! What a great idea to make the overalls in wool! I bought the virtual version of Lauren's overall pattern to get to someday! Love, love, love that Advance 2453 hooded jacket pattern. Soooooo tempted to buy it. OK... I gave in and bought it! Oh love that pattern! So glad you got it!! I have a jacket very similar but without a hood. I'm tempted to try to make a pattern from that and add a hood. It's SO cute. Would be adorable as a rain jacket!! Oooo! Yes, it would be great as a raincoat! I have a similar one without a hood as well but, I just love hoods. I don't think I've sewn one since college though. I wish I could pull off overalls but unfortunately I can't. I do plan on making a few basic wool skirts for winter. I also plan on making a few pair of trouser pants. I love my jeans but in the dead of winter jeans just make me too cold. These are all wonderful patterns. Is grading up very hard? 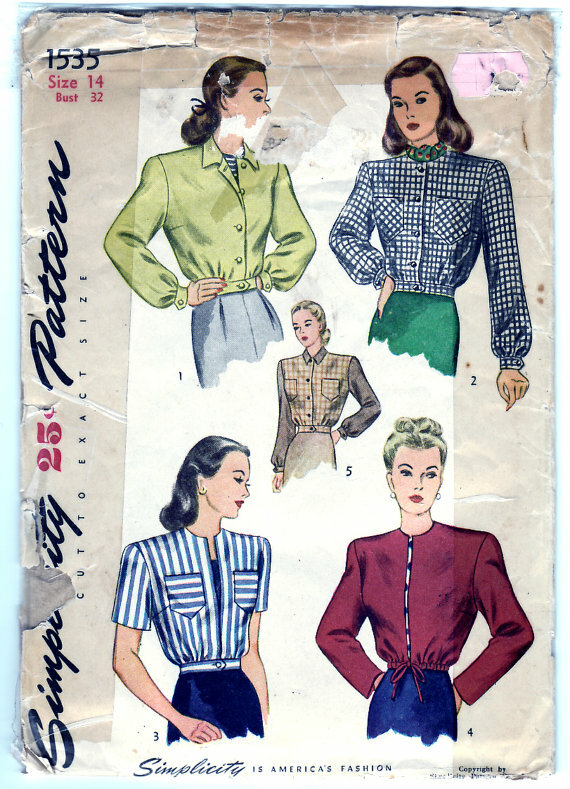 There are a ton of things I would love to make, but with an ample chest, I can hardly ever find ANY vintage patterns in my size, and if they are, they are usually ridiculously expensive. Do you have any resources or anything you could suggest? I need to make me some pants and jean too, I also have a hard to fit body,and i got to find my overall pattern,I'm sure I bought one.No need for a winter coat here but a rain coat, yes with a hood. I also need to make some trousers! In the past I usually make dresses because they are an instant outfit for me, but I need some separates desperately. 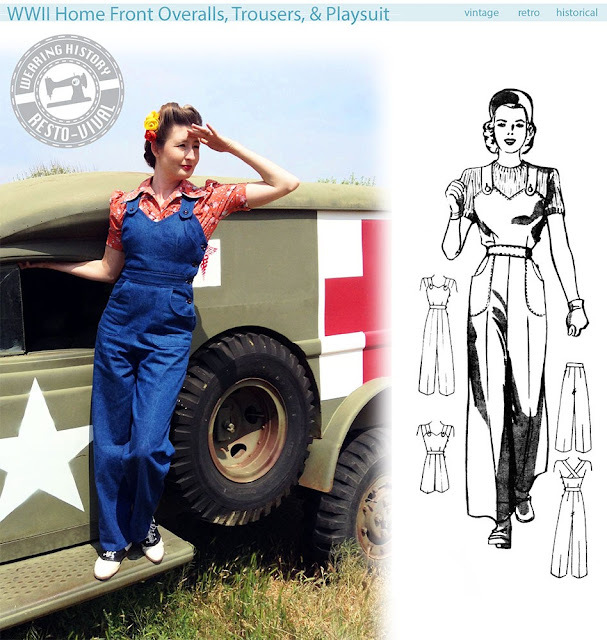 This summer I want to sew up my repro sweetheart overalls from Decades of Style. I loved Tasha's jacket too, and managed to nab a size 36 inch bust version of Simp 1535 to make my own. If you'd like a hand-copy of the pattern let me know! What a splendidly nice Mother's Day present! I've been thinking a lot about my cold weather wardrobe this month, too. I really want to find my vintage suits (pants would be amazing, too, but I have the trickiest time finding ones that work for my figure, it seems, save for my beloved Freddies) and figure that I might chance upon a better deal on a new suit or two during the warmer months (more blazers would be fab, too). Have fun with all your winter wardrobe sewing, dear gal! Glad to know I'm not the only one thinking of sewing things for colder weather. :) I've never sewn pants before, but I'm getting ready to attempt the Wearing History overall pattern, as well as the Simplicity 2836 pedal pusher pattern. My hips are always smaller than the pattern measurements, so hopefully I'll be able to get the right fit. I also happened upon two very retro looking tea cup and tea pot prints by Robert Kaufman this week that I'm thinking will make a great 50's wrap dress, so that's on my list as well. I actually own the original of the overalls pattern :) It's in my queue for when the weather gets colder.